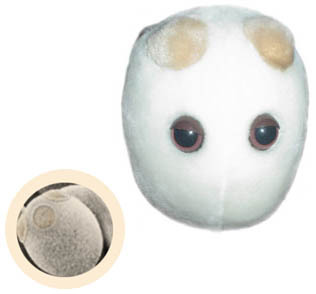 Giant Microbes are soft, plush 5-to-7 inch dolls that look like the real microbes — about a million times bigger. Each Giant Microbe includes a hang-tag with an image of the real microbe it represents, and information about that microbe and the ailments it causes. They make great learning tools for parents and educators, as well as amusing gifts for anyone with a sense of humor! C’mon... who wouldn’t want a cuddly Ebola Virus of their own? Yeast - Come and get it! This microbe is a baker, and a brewer -- and a scientist to boot. Pretty amazing! Learn about the secrets of Saccharomyces Cerevisiae. A perfect gift for any bakers or brewers you know!